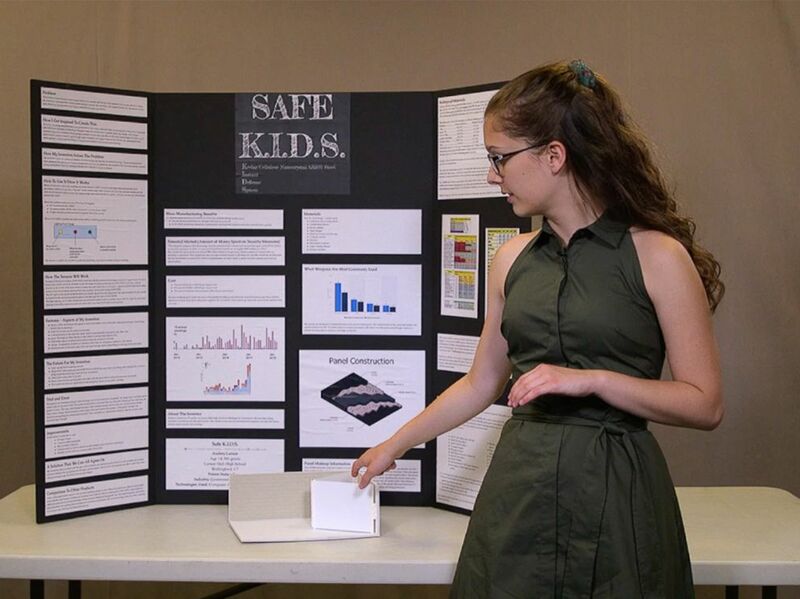 Audrey Larson, 14, is pictured on July 31, 2018, with her invention idea on how to keep schools safe during a school shooting. "As a mom I was saddened that these are the things that are on the mind of a freshman girl in high school," Lombardo said. 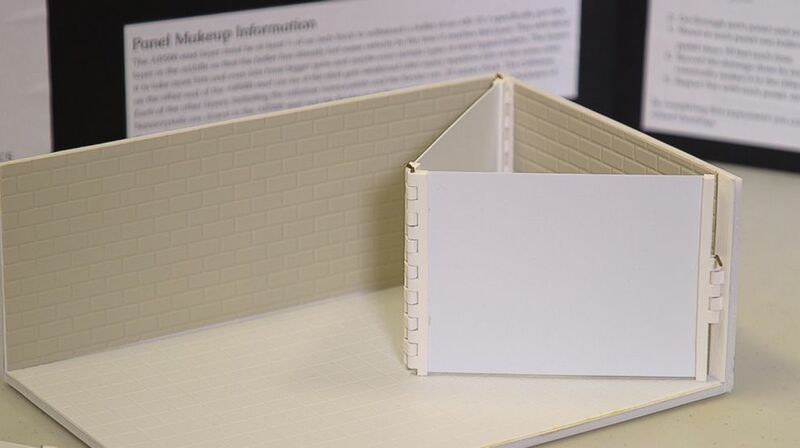 "I think as an engineer, I was fascinated with the robustness and detailed design work," she continued. Safe K.I.D.S. is a project from an invention competition that illustrates a potential solution to school shootings. Larson chose the mix of materials that could make the wall including Kevlar to help it withstand shots from guns, even an AR-15 rifle. The accused Marjory Stoneman Douglas High School shooter in Parkland, Florida, allegedly used an AR-15 in the Valentine's Day massacre where 17 students and teachers were killed. Larson's invention is in line with other bullet-resistant products, including backpacks and clothing that have been marketed to schools and parents in the wake of mass shootings. Questions have been raised about the efficacy of some of these products and more broadly, debates about the best way to keep kids safe. Larson declined to weigh in on the gun reform debate, but said she considers her invention to be a "non-political solution" to the highly-politicized issue. "[An invention] is not the only way," she said. But it "makes it maybe easier to implement in comparison to some of the other solutions as the gun control debate has been going on since Columbine." "Her solution solves a couple of very interesting problems in modern classrooms today," said Adam Coughran, who used to work in law enforcement and is president of Safe Kids Inc., a group that provides safety training sessions for educators. Coughran said many classrooms have a lot of windows to let in natural light, and glass isn't bulletproof. 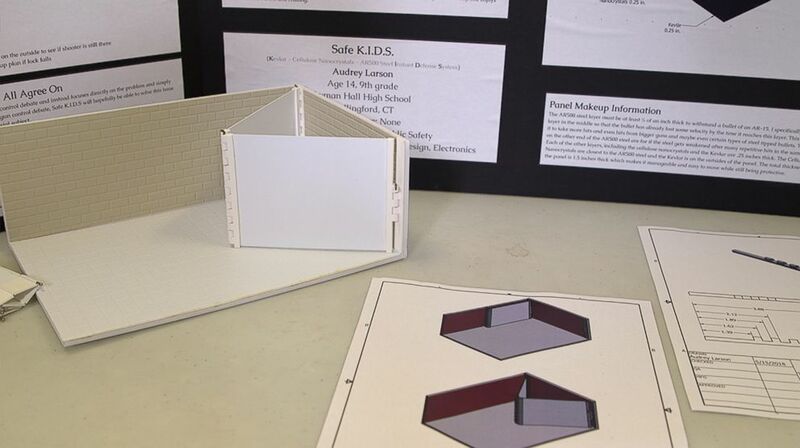 A display showcasing a bulletproof wall that 14-year-old Audrey Larson created for an invention competition.